For the Birthday Girl, you'll get treated to all the treatments below! And for the Party Guests, choose two of the four below, plus a finishing touch! We offer a styles book to help you make your make-over choices and its packed with pictures! Our lovely models sport at least 18 different hairstyles, there's a couple of pages of nail art examples, lots of pretty face art choices for our younger ladies and a bespoke make-up lesson for our older girls plus 20-30 body art 'tattoo' styles to browse. Needless to say there is something for all ages and if fact we are often criticised for having far too much choice making it tricky to decide - and wanting all of them! A varied selection of funky hair styles, plus some more traditional favourites (all finished off with your choice of gorgeous hair accessories to personalise the look). Choose from lots of girlie nail art designs - everything from paw prints and flowers to zebra stripes! Help decide on the polish and nail art colours for that distinctive 'designed by you' effect. 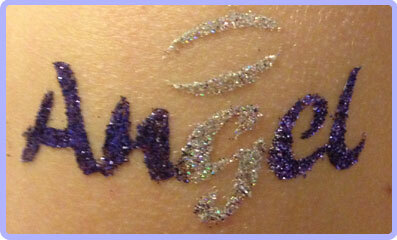 Glittering body art - choose from a variety of hand painted designs that sparkle in the light - popular on bellies, arms and backs! Individually designed make-up from cute princess pinks, through the more natural to dazzling disco diva - you decide the colours and style. For our older girls we offer more of a bespoke make-up lesson, encompassing colours that suit, how to apply, how much is too much! - and skin care tips whilst for our younger ladies we offer pretty face art designs and a touch of lip-gloss. Of course, naturally, all topped off with a sprinkling of 'sparkle' dust - or it wouldn't be SparkleWorks!